The best thing to say about the Angels system, at this point, is that these rankings stories are over. The Halos ranked 29th for position players, 30th for pitchers and received an F for under-21 talent following an offseason in which it sent its top two prospects in pitchers Sean Newcomb and Chris Ellis to the Braves for shortstop Andrelton Simmons. That was a move made with the Majors in mind and should be viewed as such, but it did leave the prospect cupboard bare. If there's good news here, catcher Taylor Ward and outfielder Jahmai Jones -- Los Angeles' top two picks in 2015 -- will make their full-season debuts this summer. To their credit, the Angels have faith they can develop this current crop into some impact Major Leaguers. If they can, they'll beat some fairly low expectations. The boastful part of the Marlins farm comes on the pitching side, and even that ranked 27th in our pitching system rankings. Tyler Kolek was meant to be the organization's shining star after being taken second overall in 2014, and in some ways he still is, thanks to his plus-plus fastball. But he struggled at Class A Greensboro last season by putting up a 4.56 ERA with 61 walks in 108 2/3 innings, and his lack of control and quality secondary pitches has knocked him out of most top-100 prospect rankings. First baseman and 2015 first-rounder Josh Naylor is the only other prospect in the system with top-100 potential, given his power, but even he seemed like a stretch at the No. 12 overall pick. Barring some major improvements, the next Marlins star in the mold of Giancarlo Stanton, Jose Fernandez or Christian Yelich just isn't in the system at present. Top Mariners prospect Alex Jackson stumbled in his first full season in 2015, hitting .157 with a .453 OPS in 28 games at Class A Clinton before a move back to short-season ball. He showed some improvements at Everett, but overall, 2015 was a step back for Jackson, who will tackle the Midwest League again this season. Unlike the Marlins, there are plenty of other intriguing options in the system. Shortstop Drew Jackson hit the ground hitting and running (.358 average, 47 steals) in his Draft year, outfielder Tyler O'Neill put himself on the map with 32 homers at Class A Advanced Bakersfield and outfielder Boog Powell was acquired from the Rays this offseason after posting a .385 OBP at the Minors' two highest levels. The Seattle system is fairly light on impact pitching, but there are enough intriguing prospects here to push them above the two cellar dwellers. If these rankings were based on talent alone, the O's would likely jump a few notches. Then there are the question marks. Top prospects Hunter Harvey and Dylan Bundy have cases to belong on top-100 lists but their inability to stay on the mound causes concern. Harvey missed all of 2015 with an elbow strain, and Bundy, a former top-five overall prospect, hasn't tossed more than 100 innings since 2012 due to myriad maladies. Beyond those two, catcher Chance Sisco has the offensive potential to be Baltimore's future backstop and first baseman Trey Mancini was one of 2015's breakout Minor Leaguers with a .341 average, 21 homers and 43 doubles in his age-23 season. But without any surefire future stars, the Orioles will need to answer more than a few questions in 2016 to climb these ranks come next year. The Tigers system got much deeper at last year's trade deadline by picking up consensus top-100 prospect and Eastern League Pitcher of the Year Michael Fulmer from the Mets, slugging infielder JaCoby Jones from the Pirates and sinker-throwing left-hander Jairo Labourt from the Blue Jays. Add in first-rounders Beau Burrows and Christin Stewart and it looks like Detroit made its system better through addition in 2015. Fulmer, in particular, looks like a pitcher who should be able to help the big club as a mid-rotation starter, perhaps as early as this season. That's good because the rest of the system took a step back. Derek Hill, who checks in at No. 3 on MLB.com's list of Tigers prospects, hit .238 in a 53-game injury-riddled season at Class A West Michigan and slugger Steven Moya continued to show contact issues by fanning 162 times for Triple-A Toledo. While the Tigers look to compete in the AL Central at the Major League level, it'll be a rebuilding year again in the Minors. Christian Arroyo and pitching -- that's how to describe the Giants system in four words. The 20-year-old shortstop is San Francisco's only top-100 prospect due to his plus bat. Back-to-back first-rounders Tyler Beede and Phil Bickford should have plenty of chances to crack the Major League rotation someday and there are plenty of other intriguing starters in Clayton Blackburn, Adalberto Mejia, Sam Coonrod and Chris Stratton and a well-stocked stable of relievers, led by Josh Osich. If you're looking for a standout tool, it might Lucius Fox's speed, which will be on display in his system debut in 2016. Otherwise it's a fairly dull system, although plenty deep. College football player-turned-standout outfielder Anthony Alford is the first truly exciting prospect mentioned thus far, earning plus grades for his bat, speed and glove in center. The 21-year-old is a few years away, but features in the top 50 of most prospect lists and projects as a potential top-of-the-order option for Toronto. On the pitching side, Conner Greene and Sean Reid-Foley are promising starters at the lower levels and fellow right-hander Jon Harris will try validate his 2015 first-round selection after some hiccups at Class A Short Season Vancouver (6.75 ERA in 36 innings). Plenty of eyes will also be on Vladimir Guerrero Jr. as he tries to show that hitting can be hereditary. The D-backs' system took a hit when they paid a big price -- including top overall pick Dansby Swanson and impressive pitching prospect Aaron Blair -- for right-hander Shelby Miller. What remains is in the upper part of the system with top prospects Braden Shipley, Archie Bradley, Brandon Drury and Socrates Brito all looking to contribute in the Majors at some point in 2016. Arizona went from five prospects in the top-100 to three and saw its top prospect's status fall from No. 8 to No. 67. It's certainly a win-now mentality in the desert. The Royals' World Series-winning campaign was built around a core of home-grown prospects. The next class of would-be stars is headed by shortstop Raul Mondesi and right-hander Kyle Zimmer -- each of whom has been at or near the top of the Royals' prospect list for going on four years. Mondesi didn't hit much in 2015, with a .243 average while challenged as a 19/20-year-old in Double-A, but his plus speed and glove made him the game's first rookie to debut in the Fall Classic. Zimmer has dealt with several injuries, including 2014 shoulder surgery, but when he's been healthy, he has plus offerings in his fastball and curveball. Thanks to that package of pitches, he too could be looking at a call-up in 2016. Right-hander Miguel Almonte and lower-level pitchers Ashe Russell and Nolan Watson are in the next group of prospects. But outside the top two, there aren't many with the ceiling to crack Kansas City's young roster. The Padres were looking at a much lower ranking with outfielder Hunter Renfroe as their lone top-100 prospect at No. 92. Then they took advantage of a deep Red Sox system in a trade built around closer Craig Kimbrel, adding outfielder Manuel Margot and shortstop Javier Guerra. Both sit in the middle of top-100 lists and instantly gave San Diego two potential stars. (Utilityman Carlos Asuaje and left-hander Logan Allen also moved into the top 20 of the Padres system after coming over from Boston.) San Diego also made news by selecting four players in the Rule 5 Draft, most notably Futures Game participant Luis Perdomo. It's incredibly unlikely that all four stick, but the moves add some intrigue to a system that lacked it just a few months ago. As was written in the pitcher farm system rankings, a lot of how you view the White Sox system might come down to what you think of top prospect Carson Fulmer's future role. The former Vanderbilt right-hander, who has a plus fastball and slider, would obviously bring the highest value as a starter. Given his 6-foot size and stuff, some think Fulmer's future is in the bullpen. If you think Fulmer can stick as a starter, that gives the White Sox two exciting prospects, along with speedy shortstop Tim Anderson. With control master Spencer Adams and reigning Arizona Fall League MVP and defensive wizard Adam Engel, the White Sox system goes a bit farther than just Fulmer and Anderson. In an age of great young shortstops, the A's have one of their own in Franklin Barreto, who was picked up in the November 2014 deal that sent Josh Donaldson to the Blue Jays. Barreto ranks in the top 35 overall in all major prospect lists thanks to a plus bat and arm, and is already looking at Double-A ball in his age-20 season. There's plenty of power in the system too with Matt Olson, Renato Nunez and Matt Chapman in the pipeline. On the pitching side, Oakland received left-hander Sean Manaea, who sits in the top 70 of most lists, from the Royals. The 24-year-old battled abdominal and groin strains in 2015, but if those injuries are behind him, he has the stuff to move into the Oakland rotation as early as this summer. The Cardinals have the biggest gulf between their pitching (seventh) and position player (28th) rankings. That's because they have a potentially special right-hander in Alex Reyes, who fanned 151 in 101 1/3 innings last season, and solid options in Jack Flaherty and Luke Weaver. Lower in the rankings are Marco Gonzales and Tim Cooney -- left-handers who already have Major League experience. Every position player in the system comes with questions, with outfielder Magneuris Sierra, who has received plaudits for his speed and defensive work in center, is the standout. Jorge Mateo, Aaron Judge and Gary Sanchez make up a core of promising position player prospects that any of the organizations above would love. All three have the potential to be regular Major League contributors and possess the individual tools (Mateo with speed, Judge with power, Sanchez with his arm) to become stars. What the Yankees lack is pitching. New York believes it took a potential leader in James Kaprielian out of UCLA with their pick at 16th overall last season, but there isn't much more pitching in the system beyond Domingo Acevedo, who could rocket up the rankings if he can expand his repertoire beyond a 100-mph heater. For excitement in the Indians system, look to the outfield. Bradley Zimmer became the organization's top prospect after breaking out in almost every major offensive category in 2015 and now sits in the top 30 of most lists. Not far behind him is former Class A Advanced Lynchburg teammate Clint Frazier, who has always drawn praise for his bat speed and put it good use with 55 extra-base hits for the Hillcats. Bobby Bradley showed exciting pop with a Midwest League-best 27 homers and 2014 No. 1 overall pick Brady Aiken could end up being a steal as the 2015 No. 17 pick if he fully recovers from Tommy John surgery. Toss in promising southpaws Justus Sheffield and Rob Kaminsky and impressive center field defender Tyler Naquin and there's an impressive base here. It's amazing that Steven Matz is still considered a prospect after joining the Mets' postseason rotation last fall. But because he hasn't yet met the Major League innings or service-time requirements, the 24-year-old southpaw gives the defending National League champs one heck of an experienced top prospect. The system also features first baseman and Florida State League MVP Dominic Smith, who has a plus bat and glove if not much game power yet, and shortstop Amed Rosario, who has the speed and arm to claim the position in Queens -- unless Gavin Cecchini, who hit .317 at Double-A last season, beats him to it. This may seem like a big drop for an organization that was the game's top system a year ago and that relied heavily on farm-grown talent to climb up to the National League Championship Series. What's scary is that Chicago still has bona fide top-100 prospects in Gleyber Torres, Willson Contreras, Ian Happ, Albert Almora and Billy McKinney. Right-handers Duane Underwood and Dylan Cease also got spots on various top-100 lists as well. Is there a future Kris Bryant, Addison Russell or Kyle Schwarber in that group? Probably not, although Torres has plenty of potential as a teenager and Contreras could be of Major League service this season behind the plate. The Rays' strength is in arms, where they placed third in the pitching rankings. Left-hander Blake Snell's breakout and rise to Triple-A was one of the best statistical stories in the Minors last season, and fellow top-50 prospect Brent Honeywell has one of the Minors' most interesting pitches in his effective screwball. It'd be a mistake to sleep on 2011 first-rounder Taylor Guerrieri now that he's fully back from Tommy John surgery and Jacob Faria showed the stats (1.92 ERA, 159 strikeouts in 149 2/3 innings), though not the stuff, at Class A Advanced and Double-A to draw attention. The system is rich in shortstops with Willy Adames and Daniel Robertson, and there are potential impact first basemen in Jake Bauers and Casey Gillaspie. There's a pretty sizable gap between the top 12 and the rest of the farm systems in this list. The Reds are in a group with the Brewers, Braves and Phillies as NL organizations clearly in rebuilding mode, and Cincinnati is off to a good start. The club already had top-40 prospects Robert Stephenson and Jesse Winker and added top-100 prospects in Cody Reed and Jose Peraza in deals with the Royals and Dodgers, respectively, over the last 12 months. (Reed alone has drawn plenty of praise in his first Reds Spring Training camp.) Amir Garrett has successfully made the move from the basketball court to the mound as a left-hander, joining 2015 first-rounder Tyler Stephenson and a contingent of former Yankees led by Rookie Davis and Eric Jagielo. There might not be anyone of Joey Votto's caliber, but there are enough potential impact Major Leaguers for a quality rebuild. While the Brewers may not possess the pitching depth of their NL Central rivals above, they have two prospects that arguably better than the Reds' top prospect. Orlando Arcia became one of the best shortstop prospects at a crowded position after hitting .307 with 52 extra-base hits and 25 steals while providing stellar defense in his age-20 season at Double-A. Outfielder Brett Phillips provided the system with a boost after coming over in a deal with the Astros along with left-hander Josh Hader. Right-hander Jorge Lopez is usually seen as the most promising pitching prospect and made his Major League debut in 2015. Milwaukee also added breakout prospects Isan Diaz and Jacob Nottingham this winter, drastically improving their farm system in just a year. This entry will begin the same way the blurb from the pitching rankings began: "The Nationals were always going to be high on this list because they have Lucas Giolito and no other organization does." Giolito possesses the tools required to dream of Cy Young awards (plural) and he is not alone in the system. With his hitting ability and speed, Trea Turner has shown that he's ready to take the Major League shortstop gig whenever the Nats feel comfortable giving it to him, and outfielder Victor Robles showed plenty of promise (.352/.445/.507) in a short season last summer. The big question marks start after that, but with Erick Fedde, A.J. Cole, Wilmer Difo and Reynaldo Lopez, there's enough for the Nats to fit comfortably in our Big 12. The Astros arrived earlier than expected by making the playoffs last year, thanks to the rookie campaign of shortstop Carlos Correa. Even after graduations and big trades, the MiLBY winners for Best Farm System of 2015 still have enough to take the ninth spot. A.J. Reed is coming off a special 2015 campaign in which he hit .340 with 34 homers and .1.044 OPS at Class A Advanced and Double-A Corpus Christi. Francis Martes had his own breakout age-19 season that saw him climb three levels and move into the upper half of most top-100 lists. Houston got even stronger in the Draft, where it used the second, fifth and 37th overall picks (and their allotted slot money) to take and sign top-100 prospects Alex Bregman, Kyle Tucker and Daz Cameron. Despite all the movement, this is a replenished system built to last. The Pirates might have the deepest system of those mentioned thus far, but beyond that they have star power. Tyler Glasnow, a consensus top-15 prospect, would look the part of future ace in most organizations but will have to settle for a spot next to Gerrit Cole in the Pirates rotation, starting sometime this summer. Outfielder Austin Meadows and his plus hit, run and field tools could someday soon give the Bucs a good problem to have, given their already crowded outfield situation. Josh Bell has the bat to be an impact Major Leaguer but will need to prove himself defensively at first. Conversely, catchers Elias Diaz and Reese McGuire are special defensively and have to prove themselves at the plate. Not to be forgotten, Jameson Taillon is returning after missing two seasons due to Tommy John surgery and hernia issues and has shown top-of-the-rotation stuff before. There are good things to say about Harold Ramirez, Ke'Bryan Hayes, Kevin Newman and Alen Hanson as well, and it's that depth that makes the Pirates stand out. Before the Braves pulled off the Miller and Simmons deals this offseason, the Phils seemed to have the best blueprint for a rebuild. The organization finally dealt Cole Hamels at last year's deadline and picked up three stellar Rangers prospects in outfielder Nick Williams, right-hander Jake Thompson and catcher Jorge Alfaro. Putting them together with J.P. Crawford (the game's second-best shortstop behind only Corey Seager), the speedy Roman Quinn and first-rounder Cornelius Randolph already made for a promising system. Then they added 2013 first overall pick Mark Appel in the Ken Giles deal with the Astros. Suffering Phillies fans can see that help is on the way, and soon -- everyone mentioned here, besides Randolph, should start 2016 at Double-A or higher. The Red Sox were one of two organizations to earn an A+ for their under-21 talent in our ratings two weeks ago, with the club's top five prospects (Yoan Moncada, Rafael Devers, Andrew Benintendi, Anderson Espinoza, Michael Kopech) all fittting the description. That core ensures that it's the lower Minors Sox fans should monitor if they want to see the future of Fenway on display in 2016. Moncada and Benintendi could be fast movers if they bring their results from the second half of 2015 to 2016. In those two as well as Devers and Espinoza, the Sox don't just have potential starters, but potential All-Stars. Whether they're used as future Red Sox or trade chips like Margot and Guerra remains to be seen. Joey Gallo, Nomar Mazara and Lewis Brinson make up the Big Three in the Texas system. Gallo's power has been the stuff of legend in the four years since being drafted and is right up there with that of Giancarlo Stanton. Even though he still strikes out way too much, the 22-year-old slugger is among the game's top dozen prospects. Not far behind is Mazara, who has decent pop himself along with a more polished hit tool and an arm that plays well in the outfield. Brinson is coming off a breakout campaign in which he showed plus power and speed along with a .332 average and 1.004 OPS at three levels. All three are easily top-20 prospects. Texas also added UC Santa Barbara star Dillon Tate with the fourth overall pick last season and saw enough growth in a short span from 2014 first-rounder Luis Ortiz to give the system two top-100 pitching prospects as well. If recent success combined with farm system talent is any indicator, the future of the AL West may come down to Houston and Texas for seasons to come. The Rockies took the top spot in the position-player farm system rankings because of their depth. There's a lot to like in everyone from top prospect Brendan Rodgers down to potential Opening Day shortstop Trevor Story at No. 11 in MLB.com's ranking. There are also enough arms to justify a high ranking. Right-hander and 2013 first-rounder Jon Gray hasn't posted the numbers to match his stuff, but his peripherals both at Triple-A and the Majors -- like his 3.63 FIP in the latter -- have looked better than his traditional stats. Jeff Hoffman is another top-100 option and could be set for a big jump as he moves one more year beyond Tommy John surgery. The right pieces are there for a youth movement in Colorado. Perhaps only the Twins could graduate a promising prospect like Miguel Sano in 2015 and still be a top-three system the following season. No. 2 overall prospect Byron Buxton still has rookie eligibility, right-hander Jose Berrios and outfielder Max Kepler both took big jumps and promising college left-hander Tyler Jay enters the system. The Minnesota farm has nearly everything. Big-time power? Adam Brett Walker II. Promising shortstops? Jorge Polanco and Nick Gordon. Flame-throwing relievers? Alex Meyer, J.T. Chargois and Nick Burdi. With Buxton, Berrios, Kepler and others looking to stick in the Majors this summer, the future might very well be here. If you wanted your franchise to start a rebuild, you'd want them to follow the Braves' blueprint. Atlanta restocked their system by bringing in top-100 prospects Dansby Swanson, Sean Newcomb and Aaron Blair this offseason alone. In fact, six of the club's top 10 prospects have been brought in via trade. As a top-10 overall prospect, Swanson has the chance to be the club's anchor at shortstop for years to come, and if he isn't, it might be because Ozzie Albies has taken over that role with Swanson moving to second. Newcomb and Blair already look like solid Major League starters and are just two pitching standouts in a system loaded with them. Atlanta's plan seems to be develop as much pitching as possible and, years from now, see who wins the battle for rotation spots, who needs to move to the bullpen and who just can't cut it. They certainly have enough assets to build from the mound out and the right position players to build a solid foundation. 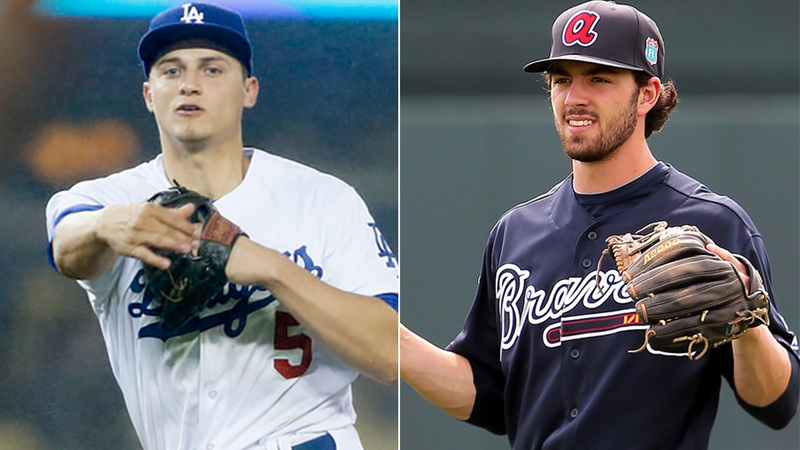 You could argue Braves vs. Dodgers for the top spot all day, but consider this: the Dodgers have two consensus top-five prospects in Corey Seager and Julio Urias and the Braves have none. Seager already looks like the future of the franchise and is the favorite to win NL Rookie of the Year after dominating in the Majors last September and into the playoffs, and Urias is poised to join him at some point in 2016, likely while he's still only 19. The Dodgers' stable of pitching prospects might not be as deep as the Braves', but with Cody Bellinger, Alex Verdugo, Micah Johnson, Trayce Thompson and Austin Barnes, their group of position players looks stronger. The system could be even better in 2016 if international signings Yadier Alvarez, Yusniel Diaz and Starling Heredia have solid first seasons. It's rare that an organization with such a potent Major League club can have an equally strong farm system, but the Dodgers have built a winner.